Have electronic tablets replaced paper? Have electronic tablets replaced paper? Have electronic tablets replaced paper? There is much talk at the moment about how tablet computers can revolutionise education. Indeed Apple’s iPad seems to have created a bow wave of interest in western society where not only do we all need a laptop and a smart phone but we need a tablet as well so that we can communicate and work on the move. This relatively new development has spurred the tech savvy to think of how the iPad might be used to do things better or faster or more reliably. For example, in my local Toolstation store, the sales assistant used to print off a list of the items the customer asked for and then pick them from the stock room. Now they have developed a system using small tablets and avoid printing. It seems that ‘Paper is out, let’s use technology’. iPads are being used by many institutions such as the GMC and the University of Dundee in their Objective Structured Clinical Exams (OSCE), where the markers score the students’ performance against various criteria. The marks are automatically uploaded and processed in real-time which enables the administrator to keep an eye on all of the OSCE stations and catch any issues as they arise. This appears to be a fantastic system but for us at Bristol, it would be difficult to upscale for our more widely distributed model where exams are held at many NHS sites at the same time. 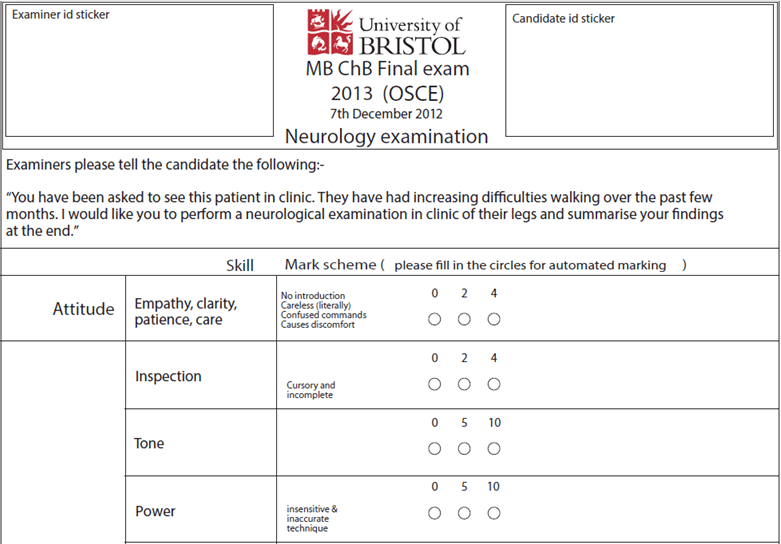 At the University of Bristol we have been using optical marking on exam mark sheets for many years but the system we were using lacked the flexibility we require for our OSCE exams. Reliable reading which will flag-up missing or multiple marks of the same question. One of the keys to this process is that we create and print QR (Quick Response) codes on Avery labels for each student. The QR codes contain the student’s name, unique student number and where the exam took place. The students are given a sheet of stickers with their name and QR code on which they use to stick on each marking sheet. In the scanning phase of the process, the QR codes are optically read and the student’s details are copied into the spreadsheet along with their marks. We also provide a sheet of stickers to the OSCE examiners so that we can identify who marked the sheet. The following is an example of an OSCE neurology station. So perhaps, much like ‘video didn’t kill the radio star’, paper still lives on and is better, in some situations, that the electronic tablet.